This section on C++ MCQs (multiple choice questions) focuses on “Template Arguments to Specify Policy Usage”. 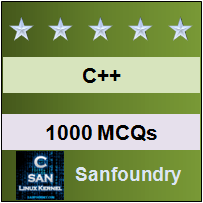 One shall practice these MCQs to improve their C++ programming skills needed for various interviews (campus interviews, walkin interviews, company interviews), placements, entrance exams and other competitive exams. These questions can be attempted by anyone focusing on learning C++ programming language. They can be a beginner, fresher, engineering graduate or an experienced IT professional. Our multiple choice questions come with detailed explanation of the answers which helps in better understanding of C++ concepts. 1. What is meant by template parameter? Explanation: A template parameter is a special kind of parameter that can be used to pass a type as argument. 2. Which keyword can be used in template? 3. What is the validity of template parameters? Explanation: Template parameters are valid inside a block only i.e. they have block scope. 4.What is the output of this program? Explanation: In this program, We are printing the integer in the first function and float in the second function. Explanation: In this program, We are using the ternary operator on the template function. Explanation: In this program, We are passing the value and returning it from template. Explanation: In this program, We are using the non-type template parameter to increment the value in the function template. 8. Why we use :: template-template parameter? Explanation: It is used to adapt a policy into binary ones. 9. Which parameter is legal for non-type template? Explanation: The following are legal for non-type template parameters:integral or enumeration type, Pointer to object or pointer to function, Reference to object or reference to function, Pointer to member. 10. Which of the things does not require instantiation? Explanation: The compiler does not generate definitions for functions, non virtual member functions, class or member class because it does not require instantiation.